One Homestead Emporium Ultimate II Pad. Approx. 12.5" topped with Bamboo Velour. First four are Daydream, then 3 x Hard Candy (purple/blue), followed by 3 x Rainbow Marble (far right). This listing is for one pad. 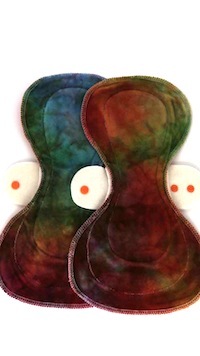 One Homestead Emporium Reusable Sanitary Pad. Wider at the back then the front with tab style wings attached to the back. The curviest pad of all, wider at the back than the front and tab style wings attached. First four are Daydream, then 3 x Hard Candy (purple/blue), followed by 3 x Rainbow Marble (far right). 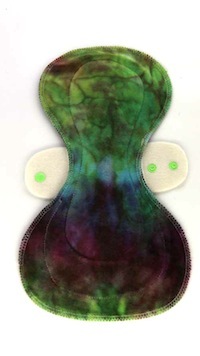 You will receive one pad from the chosen colourway. 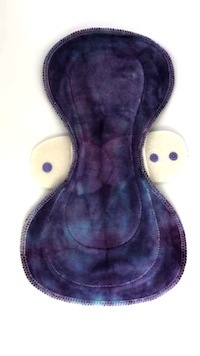 Each pad is a one of a kind hand dyed item. If you have a preference to which pad you would like please state in the comments at the checkout. Subject to availability.